Powerful 3D printing in a small package. The Polar Classic 3D printer was designed exclusively for the classroom. It is the first 3D printer based on polar coordinates delivering 3.14 times the volume compared to Cartesian-designed printers. The built-in Polar Cloud allows teachers to save, store, and share 3D printing files with other teachers and students. Each printer has a built-in camera so you can monitor your printing remotely through the Polar Cloud App. Great for students to learn about 3D printing in and outside of the classroom. The Polar 3D 1 Year Extended Warranty provides you with access to expert technicians and dedicated customer support. It covers all support, service, and replacement parts for up to 3 years. 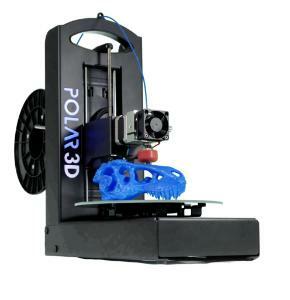 The Polar 3D Printer Starter Pack is the perfect option for anyone starting to 3D print. The pack includes 1 Polar Classic 3D printer, 6 rolls of 1Kg filament, 1 year extended warranty.